Make your dining room or kitchen warm and inviting with help from these side chairs. 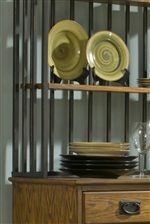 The pieces consists of an aged bronze finish with gold highlights as well as vertical slat back. In addition, the sculpted seats feature oak veneers and a clear-coat finish. Complement your dinner table with earnest elegance by adding these dining side chairs to your home decor. 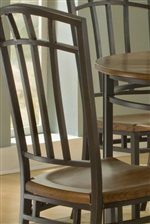 The Oak Hill Dining Side Chairs (2pk ) by Home Styles at AHFA in the area. Product availability may vary. Contact us for the most current availability on this product. The Oak Hill collection is a great option if you are looking for Casual furniture in the area.